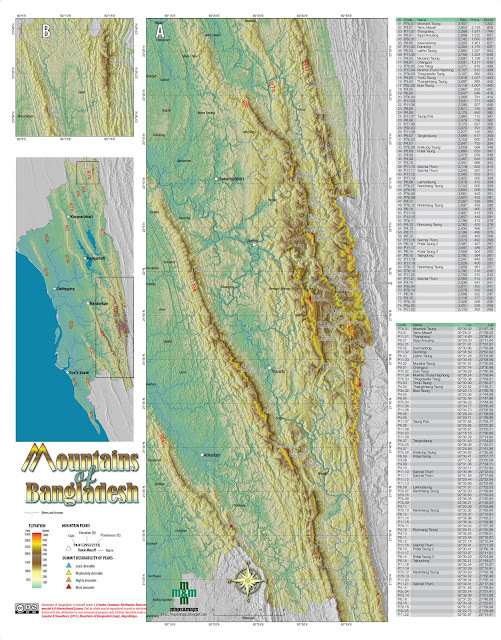 Based on a fresh analysis of the finer SRTM 1-ArcSec digital elevation data made available in January 2015, here is a map of the mountains of Bangladesh with elevations greater than 2000 ft and topographic prominence greater than 300 ft. 75 such mountains are shown in this map, and the list below. 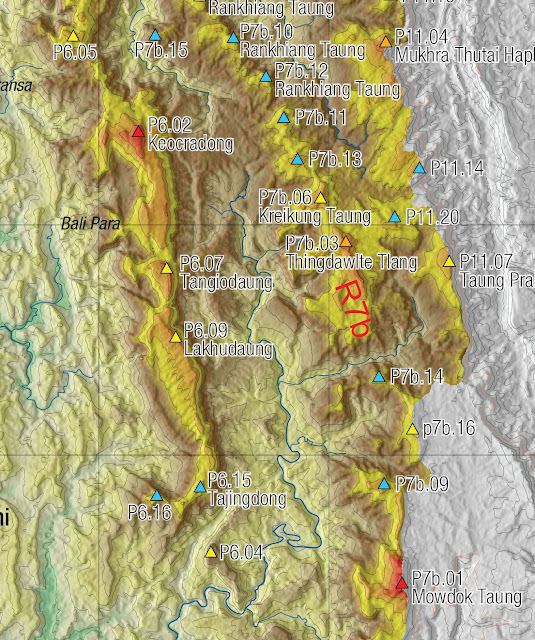 P7b.01 Mowdok Taung 92°36'35.46" 21°47'11.30"
P4.01 Temu Massif 92°28'18.49" 21°39'31.54"
P6.01 Sippi Arsuang 92°29'1.58" 22°11'2.52"
P6.03 Lakho Taung 92°31'16.57" 22°4'3.52"
P4.02 Munaha Taung 92°31'18.51" 21°30'3.50"
P7b.02 Zow Tlang 92°36'17.49" 21°40'22.52"
P11.04 Mukhra Thutai Haphong 92°36'14.56" 21°58'56.57"
P7b.03 Thingdawlte Tlang 92°35'22.52" 21°54'36.51"
P4.03 Tindu Taung 92°30'5.56" 21°38'16.38"
P4.04 Thaingkhiang Taung 92°22'49.49" 21°49'12.50"
P3c.02 Busi Taung 92°22'7.60" 21°29'45.45"
P11.07 Taung Prai 92°37'37.36" 21°54'10.40"
P7b.06 Kreikung Taung 92°34'49.58" 21°55'33.52"
P6.08 Poliai Taung 92°30'24.35" 22°7'46.36"
P11.10 Saichal Thum family 92°30'58.53" 22°22'32.55"
P11.11 Saichal Thum family 92°31'34.51" 22°17'40.50"
P7b.07 Rankhiang Taung 92°32'11.91" 21°59'56.22"
P7b.10 Rankhiang Taung 92°32'55.47" 21°59'2.46"
P4.12 Runcrang Taung 92°26'30.53" 21°40'16.53"
P11.16 Saichal Thum family 92°30'54.46" 22°21'16.51"
P6.13 Poliai Taung 2 92°30'24.48" 22°6'10.54"
P6.14 Poliai Taung 3 92°30'17.50" 22°4'52.52"
P6.15 Tajingdong (Main) 92°32'12.54" 21°49'16.49"
P7b.12 Rankhiang Taung 92°33'38.04" 21°58'11.40"
P11.21 Saichal Thum family 92°32'18.50" 22°17'20.52"
*Summitability score is calculated as (PeakElevation*100/QualificationElevation)+(Prominence*100/QualificationProminence), where QualificationElevation=2000ft and QualificationProminence=300ft, therefore a mountain which barely qualifies on both measures will have a score of 200. Anything below 200 is not a mountain. I had the hillwalkers and peakbaggers in my mind when I first started doing this analysis. All the best for all who walks that difficult terrain. I wish I could accompany some of you some day. 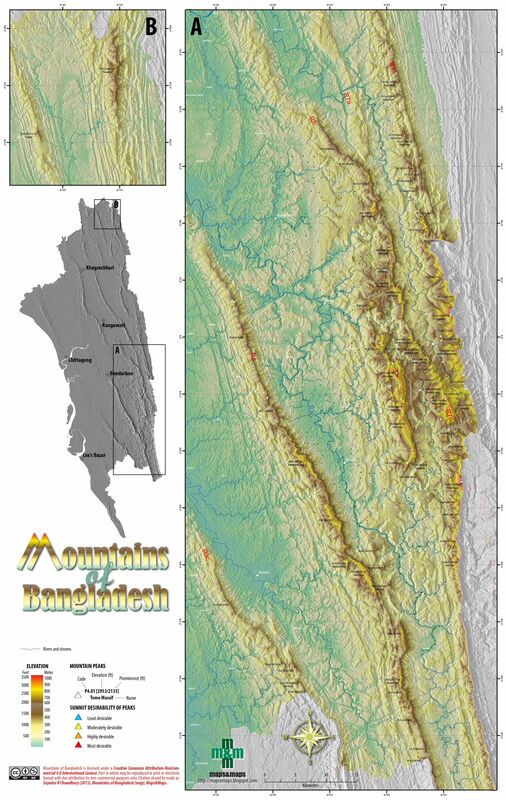 The peaks you are mentioning are on the Mawdak Range which lies on the International Boundary and hence the peaks do not belong to a particular country alone. In fact, it is a No Man's Land. There is no such rule as such. Moreover, you might know that Mount Everest itself is on the border between Nepal and China. So do all the peaks I have shown on my map. Some of them, including the Mowdok Taung, might be near the border of Bangladesh and Myanmar, but I have shown only those which are completely in Bangladesh side (according to the best known location of the border). does "Summitability Score" any term? can you please provide more information about that? Thanks for your interest. As I wrote at the end of the list "Summitability score is calculated as (PeakElevation*100/QualificationElevation)+(Prominence*100/QualificationProminence), where QualificationElevation=2000ft and QualificationProminence=300ft, therefore a mountain which barely qualifies on both measures will have a score of 200. Anything below 200 is not a mountain." Which means, this is a score which will give a proxy indication of the attractiveness of a peak to a summiter. Hope this helps. Does being an Indian always have to mean being a mean link-dropping idiot?